If you're not seduced by the appeal of video-on-demand apps or renting movies on your TV, you should consider Sharp's LE835X TV alongside contenders like the Sony HX820, Samsung Series 7 and LG LW6500. It's got good (if not perfect) picture quality, better than average internal speakers. We would have liked it to be a little less expensive, but otherwise it's worthy of our recommendation. Sharp has been quiet in the TV scene for the last year, after its initial push of Quattron LED TVs. While the company has kept up with most market trends (3D, 200Hz, USB ports) it hasn’t paid much attention to the swathe of video-on-demand and IPTV services becoming common in televisions from competitors. If these kind of services appeal to you you’d be best served looking elsewhere (or picking up another company’s Web-enabled Blu-ray player), but otherwise we have no beef with the new Sharp LE835X range. The Sharp LC40LE835X we tested is the smallest model in Sharp’s top TV range, with more extravagant tastes and larger rooms catered for with 46in, 52in and 60in models. The LE835X has a shiny black bezel that’s attractively thin, although the lengthy AQUOS logo on the top left is slightly distracting. The TV’s lower bezel has the Sharp logo and a light-up chevron, as well as a basic range of touch-sensitive buttons for power, volume and channel control. Sharp’s TV designs have never been too far out of this world, but we think the LE835X strikes a good compromise between fashion and familiarity. 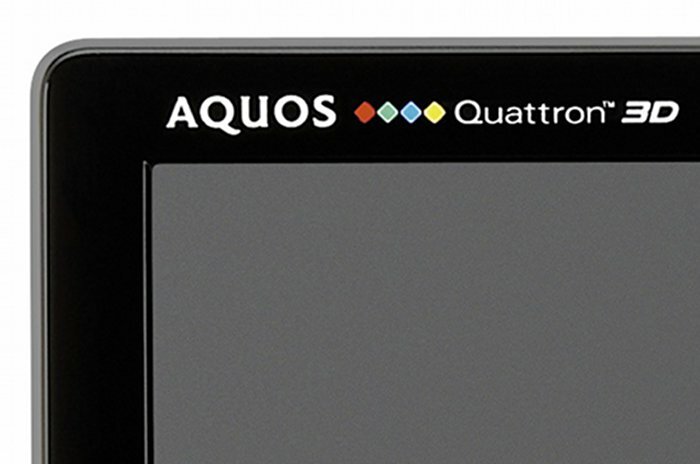 The AQUOS Quattron logo stretches along the TV’s top -- we’d prefer if it wasn’t there! As is standard practice for high-end TVs, the Sharp LE835X has four HDMI ports (one with Audio Return Channel, for connecting a Bluray-home theatre combo system), three USB ports for removable media, VGA, component, composite and various audio outputs. Sharp’s on-screen interface is a little confusing to behold at first (it’s arranged across the top of the screen, and you’ll need to do a little research to find things like input naming or to re-scan for new digital TV stations) but the initial TV setup process is simple — connect everything you need to the TV (power and antenna at a minimum), choose your location and sit back and relax as the LE835X completes a quick scan for digital TV stations. The TV has three USB ports, each of which can be used with a USB flash drive or portable hard drive. We hooked up a 500GB drive filled to the brim with MKV, AVI and MP4 files of varying resolutions from 480p to 1080p, and found that every one we tested worked successfully. Sharp’s use of the Ethernet network port on the LE835X (there’s no Wi-Fi) extends to using the TV as a large-screen Web browser — useful for checking Wikipedia or IMDB during an ad break, but of limited value thanks to the reliance on a remote control for navigation. You can also use the TV for Skype chats with a third-party webcam. The Sharp LE835X range of TVs use edge-lit white LEDs to light their LCD panels. This is the most energy-efficient way of running a TV (short of using an advanced OLED panel), but overall image contrast — that’s the dynamic range between ‘absolute’ white and ‘absolute’ black on the screen — is lower than a plasma or a LED-backlit display. With this caveat in mind, the Sharp LC40LE835X does a very good job of displaying both broadcast digital TV and 1080p/24 Full HD Blu-ray video. Even in the default Standard settings the Sharp LC40LE835X has good detail levels and a wide range of visible detail in dark and bright areas of the display . We’d put it roughly on par with Sony’s HX820, Samsung’s Series 9 and LG’s LW6500. Doing a little bit of fine-tuning to calibrate the TV for the dim room we tested it in resulted in deeper blacks at the expense of a small amount of overall screen brightness. You can also enable an auto-dimming feature that dynamically adjusts contrast and brightness (and power consumption) to suit your room’s lighting conditons. The screen’s 200Hz mode does a great job of smoothing out video, although it does come at the cost of a bit of backlight brightness (not a problem if you’re in anything other than a bright daylit room). We don’t have any specific gripes with the LE835X’s image quality. It only comes unstuck when displaying very contrasty material, like our usual torture test of The Dark Knight’s opening white-light-on-black-background scene, with the whole scene tending towards darkness rather than the brighter grey tones Samsung and Sony’s dynamic lighting creates. It’s best enjoyed with a Blu-ray movie, and while it doesn’t have the same per-pixel sharpness as Samsung or Sony’s best panels we were happy to kick back and watch Sharp’s top TV for hours on end. We didn’t test the screen’s 3D mode. A pleasant surprise came from the speakers built into the thin body of the Sharp LC40LE835X — that’s because in addition to the two 10W stereo speakers, there’s a 15W woofer to add a bit of low-frequency kick. We tweaked the sound during a digital TV broadcast (of a NASCAR race, of all things) by boosting treble and bass and turning on SRS TruSurround HD, and found it impressive for such a small and thin television. Sharp has done a good job all-round with the LE835X. The TV has no video-on-demand access, but that can be rectified by buying a Web-enabled Blu-ray player from a company like Samsung, LG or Sony. The television’s picture quality is good, as is sound, and we’d only have to see a few hundred dollars shaved off its price for it to be a good value purchase.